So I’ve made it to post number two. I like to celebrate little milestones (however tiny they may be!) so I want to write something special. ….And now the pressure is on and my mind is zombified. They’re one of the perfect mythical creatures when you think about it: closely related to a real animal, so the possibility of their existence isn’t as far out there as, say, the spaghetti monster. Yet they are so inherently pure and good that the thought of them living in this crazy place we call reality is pretty much inconceivable. Heck, they won’t allow anyone but a beautiful virgin to so much as touch them! It’s that perfect purity that has always inspired and haunted me. Most of us want to be virtuous, that much is obvious. But to really be pure, not just act it out every now and then for the sake of looking like a good person, that’s painfully impossible. We all fall short of the unicorn. I’m always reminded of that episode of Friends, where Phoebe sets out to do something for another person without any kind award or of self-gratification. It ended up being impossible to do anything truly selfless; she gave $200 to an organization she hated, which indirectly helped Joey get a job with them. Immanuel Kant goes into the idea as well: anything “good” we do, we can’t help but feel happy with. And there’s the catch, on some level, we’re all subconsciously doing good for our own self-gratification. But the unicorn (in popular myths) is simply good, there is no other possibility. We can go on to argue that the unicorn is inherently neutral in the sense that it has no choice in its disposition, whereas we can choose to do good or evil. But I’d rather stick with this simple fact for now: Unicorns are the purity that we all inherently aspire to, but can never reach. Whether it’s really in our best interest to be a unicorn is up for debate. Love the piece on the unicorns. 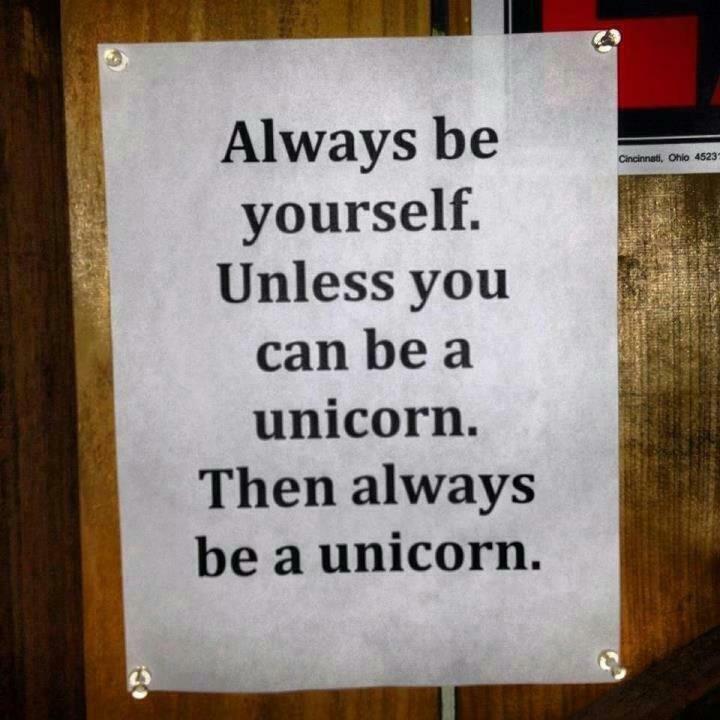 I believe the reason why we can’t reach that pureness that is the unicorn is we all have a lite and dark side. Some people are more so on one side but in the end we all have both as humans. And that is what is so beautiful to be human. Because we have the choice. And in a way we are more pure in the end then the unicorn because we choose to be pure. Or at least try to be. I would much rather have a vile of unicorn blood. There’s something beautifully macabre about that.